Working in a centuries-old continuum of metallurgy and craftmanship inherited from his Irish past, glass artist Karl Harron combines lead- and sulphur-bearing glasses with fine silver to create elegant kiln-formed vessels whose etched and light resonating surfaces have an elemental essence. In sculpting his glass Harron moves from traditional vessels to exciting expressions of “form and material” conveying ideas and visual poetry, while still retaining vestiges of their original function. “These vessels are both functional and enveloping. They embody the preservation of materials and the containment of things precious to us, symbolising fragments of history, reflecting the every day, and conversely the revered. They narrate a story, from where they came, and their reason for being”. 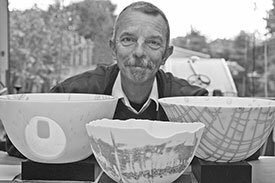 Karl Harron, born in Belfast 1953 is a respected and successful master glassmaker now based in Northern Ireland. With an emphasis on design-led, innovative work, his distinctive style is characterised by the subtle tones and complex mark making created by exploiting a third element within the body of his pieces, created at the interface between reactive glasses. Although emerging out of the same specific process, no two pieces are ever identical, each being created a new allowing for an organic growth of form. Through engaging with the material in both its fluid and solid states he reveals delicate imagery not usually associated with glass and his aesthetic vision demonstrates a profound appreciation of processes and critical enquiry. Harron is a contemporary maker who has established professional glass studios, authored accredited glass courses and continues to facilitate international master classes as part of his professional practice. Specialities: Master Craftsman and Glassmaker. Master Class Facilitator. His work is held in Private, Corporate and Public Collections throughout the world. North Lands Creative Glass Lybster Scotland “Elemental”. National Glass Centre Sunderland England UK “Showcase”. The Scottish Gallery Edinburgh Scotland “The Irish Connection” & “Connections”. The National College of Art and Design Dublin IRL. Glass Society of Ireland “Solas”. Portfolio @ Solomon Fine Art in collaboration with The Doyle Collection Dublin IRL. Sculptural Objects Functional Art (SOFA) Chicago USA.